My name is Dawn Scranton. I’m the founder of White Castle Company -- a company that’s committed to helping businesses become more efficient, productive and profitable with the help of QuickBooks applications. I’m also the author of the popular book, QuickBooks Add-ons & Integration Consulting. As a former Certified QuickBooks Professional Advisor (CQA), with over 18 years of experience in educating, training and supporting QuickBooks users, I know for a fact that, although QuickBooks is regarded as the easiest accounting program for non-accountants, most beginners are intimidated by its complexity. "Dawn Scranton has a long history with QuickBooks, Intuit, and IDN." Hire “certified” QuickBooks-savvy bookkeepers and employees without fail. Just imagine how much easier your business (and your life) will be if you’re able to do all of these easily, effortlessly, and inexpensively. It would be just like having a Certified QuickBooks Advisor sitting by your side and helping you as you start using QuickBooks... monitor tax deadlines and routine financial reporting... and evaluate prospective bookkeepers. Here’s exactly what you’ll find in the QuickBooks Rescue Kit and how it will lift a ton of trouble off of your shoulders, and save you considerable time and money. Recording customer payments and deposits. With the help of this concise, direct-to-the-point guide, you’ll get through the hoops of QuickBooks without getting bogged down by technical jargons and information overload. And know which method to use and when. With the 3-Step Picture Guide to Using QuickBooks Effectively, you’ll cover more area and save more time and energy than by trying to figure out by yourself or hiring a tutor. 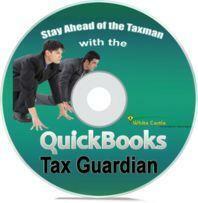 And it can also serve as your quick reference guide anytime you need a refresher in using QuickBooks in the future. With so many local, state and federal taxes to pay, tracking personal and business taxes is a pain in the neck. And despite your diligence, you most probably missed paying some taxes on time… or used the wrong tax return form... or filed with the wrong office. -- with just a glance at your computer screen. Individual reminders will also pop-up 3 days prior to due dates. And reminders will continue to appear in your “To Do List” until you mark the task as done. With the Tax Guardian running in your computer, it would be just like having a tax accountant helping you keep a watchful eye on tax deadlines and other financial obligations. Just imagine how much easier your life will be with this kind of assistance. No more myriad tax deadlines to bug your mind. No more worrying about filing the wrong tax return. And definitely no more painful penalties and surcharges. from Inexperienced QuickBooks Bookkeeper with the "Employment Guardian"
If you ever had the misfortune of hiring an employee who misled you about his or her skills in using QuickBooks, then this QuickBooks pre-employment test is just what you need. The QuickBooks Employment Guardian will help you assess satisfactorily a job seeker’s accounting knowledge and QuickBooks skills, even if you’re not a QuickBooks expert yourself. With the Employment Guardian in your hand, you’ll never be taken again for a ride by a not-so-honest prospective employee, and, save yourself from a lot of trouble and frustration. And that's just a fraction of what you’ll get from the QuickBooks Rescue Kit. That's why you should own this package today (in fact, you can be download it in as little as5 minutes from now!). What's a Valuable Resource Like This Worth? To have someone do all the research and compile the laser-focus information you’ll find in the QuickBooks Rescue Kit, it would easily cost you several hundred dollars. And if you hire a programmer to develop an innovative add-on program… that would easily put you back several hundred dollars more. 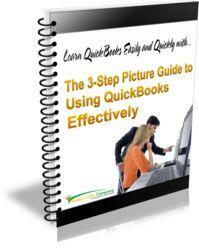 Of course, you can use QuickBooks user manual to help you get started. But, given your busy schedule, you probably don’t have the time to comb through a long, jargon-filled detailed manual. You may also choose to take a one-on-one tutorial from a Certified QuickBooks Advisor. But at $90/hour, with a minimum of 1 hour session, it’s probably not the most cost-effective way to learn QuickBooks. And, of course, with a tutor you’ll only get a tutorial. No guide questions anddefinitely no smart tax monitoring program. Which is why the QuickBooks Rescue Kit is such a huge bargain even at $150. But you’re not going to pay anywhere near that amount. Not even $99, or $67. Because for a limited time only, I’m offering the QuickBooks Rescue Kit for ajaw-dropping price of only $37. Clearly, this is a no-brainer bargain for you. And yes, I plan onraising the price from $37 to at least double that amount very soon. So you'll want to be quick if you want to take advantage of this fantastic offer. $37 is a drop in the ocean compared to the speed, convenience and peace of mind you get with the QuickBooks Rescue Kit. But if you’re already well-versed with QuickBooks and just want to take advantage of the Tax Guardian and/or Employment Guardian, you may also do so. 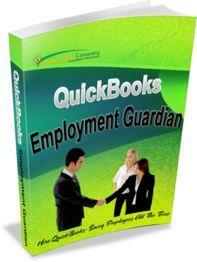 Just click on the separate order link below for the Employment Guardian or Tax Guardian. But I must say you’ll be missing on a really great bargain if you chose to buy separately instead of taking advantage of the entire QuickBooks Rescue Kit. And don't worry, if for any reason you're not happy with the QuickBooks Rescue Kit, -- or with any of the individual products you purchase -- you have my full, No Questions Asked, 30-Day Money-Back Guarantee to protect your investment. You're my valued customer. So if you're not happy with what you discover from the QuickBooks Rescue Kit or from any of the individual products you purchase, I don't expect ... or want ... to keep your money. Just simply email or call me within 30 days of your purchase, and I'll happily refund your money in full. 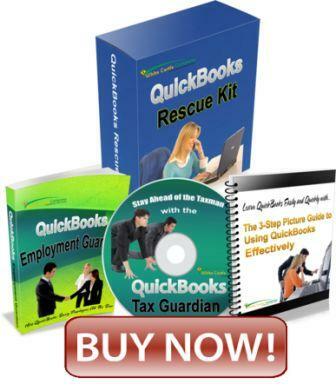 Although you need to uninstall the Tax Guardian (if you have already installed it) to get a refund, the 3-Step Picture Guide for Using QuickBooks Effectively and the Employment Guardian” are yours to keep no matter what as a "thank you" gift from me! But don't take my word on how great this package is. Listen to what business owners, accountants and bookkeepers have to say about the QuickBooks Rescue Kit. "I wish I had found these tools three years ago!" "Finally! – Thank You! For providing tools that saved me thousands during my hiring decision." Clearly, these people are very happy with the QuickBooks Rescue Kit. Just like you'll be. Remember, for a mere $37, you're getting all you need to get up to speed in using QuickBooks... stay on top of tax deadlines and other reporting requirements... and ensure you hire the right QuickBooks bookkeeper every single time. Just imagine how much time, money, and effort you’ll save by being able to do all of these quickly, easily and expensively. Order the QuickBooks Rescue Kit Today! P.S. Don't forget, you’re getting $270 worth of products for just a fraction of that price. For only $37, you’re getting everything you need to have the easiest, quickest way possible to get started in using QuickBooks. You’ll also get what you need tostay ahead of the Tax Man and know how to choose bona fide experienced QuickBooks bookkeepers and even accountants. So if that's what you want to do, this is the opportunity you've been waiting for. Order Securely Today. P.P.S. If you have any questions about the QuickBooks Rescue Kit, do not hesistate to contact us by phone, fax or email. (Click here to see our contact details). You may also check out the "Frequently Asked Questions" page for more details. Note: when you click the link above, you’ll be taken to a secure and protected order page operated by Clickbank.Com. After filling out your form, you’ll then be taken to the “Down Load” page where you can download the QuickBooks Rescue Kit immediately. The QuickBooks Rescue Kit is a downloadable package. No physical products will be shipped. After you order, you will get INSTANT ACCESS to download the pack onto your computer.